For me solace while writing article is : good sitting arrangement, cup of tea/coffee and laptop/desktop at night, however all the leisure are not always available and sometimes you have to find healthy alternative while you are on the go or maybe not close to all your coziness. It was a hard time thinking of any alternative, like, can anything replace a laptop with all the power and screen size it has, I am talking about 15.6 inch here, however somehow I managed to convince myself. I was in search of something which could just fit right on budget and had similar capabilities to a laptop however I wanted something more portable with data connectivity both WIFI and 3G, now you would think that’s not a laptop feature right, yes, I wanted a tablet ! OK, so now I am also considering getting rid of keyboard, well YES if it’s ultra portable and on-the-move I had to shred that off too. Before I jump right away and reveal which TAB I purchased, let me just quickly tell you that I was always a desktop/laptop person, and till the day I purchased the TAB, I had not use it before, yes I am serious. So, after busting out quality time (burning the midnight oil) on research for decent TAB, I narrowed down to 3 contenders and out of those 3 the victorious one was ASUS ZENPAD 7.0 Z370CG, want to know why? I have it covered for you don’t worry. Considering the list mentioned above as my parameters while searching the TAB, the ASUS ZENPAD 7.0 Z370CG was hands down the best in the parameters I wanted and at a reasonable cost too. Power and Memory: The ZenPad 7.0 (Z370CG) is a beast when we talk about power, with a quad core Intel Atom X3-C3230 system on a chip. Its clock speed is 1.3 GHz, with a quad core processor, this tablet sis more effective at multitasking compared to tablets with single core CPUs. Lasting Battery: Unconventional as it may sound, the ASUS ZENPAD 7.0 Z370CG is the world’s first tablet to have interchangeable rear elements allowing you to add a longer lasting battery. So, if you opt for an add-on battery then you will get 14 hours battery life instead of 8 hours which is preinstalled with the device. Crisp Sound Experience: Again a first in the segment, the rear elements back of the device allows user to connect with integrated speaker within a protective tablet cover, it’s a special Asus made cover and really packs a punch when it comes to music. It’s not just loud as it has balance and element of 5.1 surround capabilities, apart from that it features the world’s first integration of DTS-HD Premium Sound, so watching movies on the tab is like a mini theatre experience, I also liked the smooth transactions and details of low key frequencies. Wide Screen: Yes, the ZENTAB has a 72% wide screen-to-body ratio that’s bigger than most of the TAB in the market, which means a much better viewing experience at up-to 178 degree viewing angle. Back Panel: I am impressed by the back panel, I have a Leather Black finish and I like the texture and feel of the same, it gives a better grip as well and look classy. ASUS Audio Cover: It’s basically a sound bar attached to a cover, so you don’t need extra sound bar to carry, saves space and looks sleek, as it’s all in the cover, so it does a dual job, smart isn’t it ! I am quite happy and content with the performance of ASUS ZENPAD 7.0 Z370CG, finally I found an alternative power packed with features and has the capability of true multitask besides being a TAB. I also got a portable keyboard to go along with the TAB, so now I don’t have issues about typing long draft/post on screen. Yes, finally a portable companion while I am on the go. 1) Super processor – with a 64 BIT Quad Core processor of Intel Atom processor series web browsing, playing high configuration games like racing, fighting, strategic heavy multi player games shall be a super smooth experience, which in many smart phones we see these days have the tendency of lagging due to lower inbuilt RAM. 2) RAM Power: Super 4 GB RAM DDR3 of dual channel inbuilt which again is blessing for all those heavy social media geeks, gamers ,intensive browsers and videos watchers! 3) Crisp Camera – Front and Rare: Considering the price range, Asus is offering a 13 mega pixel rare with aperture of f/2.0 Camera which is amazing with 4128 x 3096 pixels and 5 mega pixels front camera, auto focus and dual LED flash, that’s almost as good as a high end phone camera feature, compressed in this Asus Zenfone 2. 4) Better Picture: So, now clicking pictures will be bliss with its 16 million colors 5 inch screen and 13 MP camera, one more cool feature is night photography, the camera has a booster to brighter the image by almost 400% at night with its pixel enhancing technology for capturing those amazing night clicks. 5) Design and Controls : The design if you see is a big curved, suiting a fair fit in the palm for that comfort of holding it for a longer time while we read, browse, play games, or simply text, besides that there is a key at the rare of the Asus Zenfone 2, which is perfect to take selfies, works as a volume rocker, i am totally loving this design factor because of the concept to keep the key in the center, that way it’s easy to navigate for both left handed or right handed person and it feels more natural fitting just right in the center! 6) Super booster battery: Now, this is a revolution in mobile history, you can get the phone charged by 60% in 39 mins, that like a life savior when you are traveling and you want to watch movies, listen to music, check emails and browse the net, specially you have some important calls to make or maybe you require to have VoIP call on 3g which consumes lots of battery, the battery is comparatively more capable of charging faster with its BoostMaster technology. 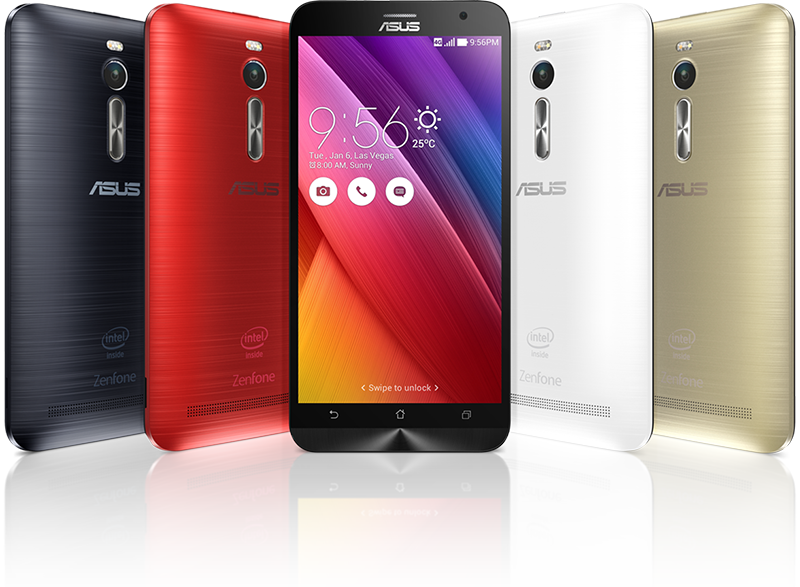 WE know that these days phone are no longer bringing on the style statement really, same old solid colors, square body and a pretty flat 5 to 7 inch screen, so to change a vibe and get a classy yet stylish look Asus Zenfone 2 introduced the transfuse and illusion series, the color combination and those multi carat design is such form factor and appealing as a design, you can check the image below and decide it for yourself! 8) Display: The display screen of the phone is protected by Corning Gorilla Glass 3 which makes the screen stronger and tougher, as we see these days phone do tend to fall from our pockets, hands, desks here and there, so a solid screen does help ! 9) 4G Ready: The phone comes with dual SIM card support and also supports 4G LTE connectivity apart from 3G, GPRS/ EDGE, GPS/ A-GPS, Bluetooth, Glonass, Wi-Fi, USB OTG, and NFC, as we know that 4G has commence its presence in India. 10) Amazing Price: with a price range of between 13000 to 21000, and if we compare the features the fav phone offers, i feel that this has to be the best bet, with feature rich and classy looks this has to be a must buy for everyone looking for a budget phone and who don’t want to compromise with good features. I am talking about 10 years back, few things which came to my mind when dad used to say beta lets go to the bank, it sound boring, lethargic and you knew the reason why your dad is taking you to the bank, basically it was less of a learning experience and more of a standing in the Q experience. Well banking has turned tables surprising when it comes to adopting new and secure technology and constantly updating themselves with time, in the prominent list of adaptability with cutting edge technology comes the name of a familiar and growth oriented AXIS Bank. Axis bank to what I know as a customer have always adopted according to the customer behavior time and time again, to add to the list they recently updated their app on mobiles with compatibility to every smart phone OS that includes Andriod, Apple, windows, blackberry. * You can only register one account per device at a time and that too your register sim card needs to be in the device, which I feel is a very secure oriented feature and this will help in keeping phishing off bay. * A good feature in regards to security is even if your phone is idle for 5 minutes the app automatically logs off, considering that the user might not have the phone with him, I am impressed -details so minimal yet a possible threat is worked upon at Axis Bank. * Setting the transfer limit, for the 1st time app download OR New registration, a limit is set to 30,000.00 which can be changed from a week time considering security reasons, and after that you can change and set your transaction limited upto 10,00,000.00. 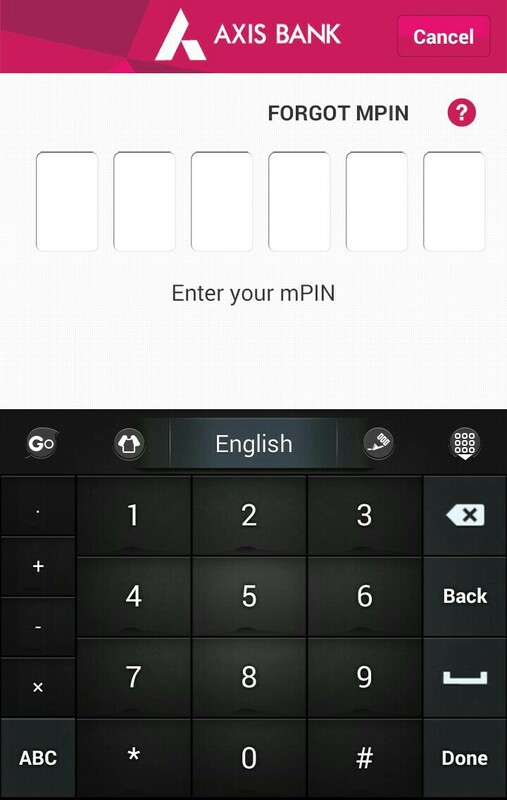 No need to add in login credentials and password, with Axis bank’s app you just need to remember your MPIN which is generated at the time of registration, so now you banking details are just 6 digits away isn’t the cool. A) Don’t you hate it when you login in to your account after putting in login id and password, then go and find account details, under that find current balance and finally after a good 2 minute struggle you get your own bank balance, but with the axis bank app, balance is just right in front of you after you login with your MPIN, just hardly takes 5 seconds. 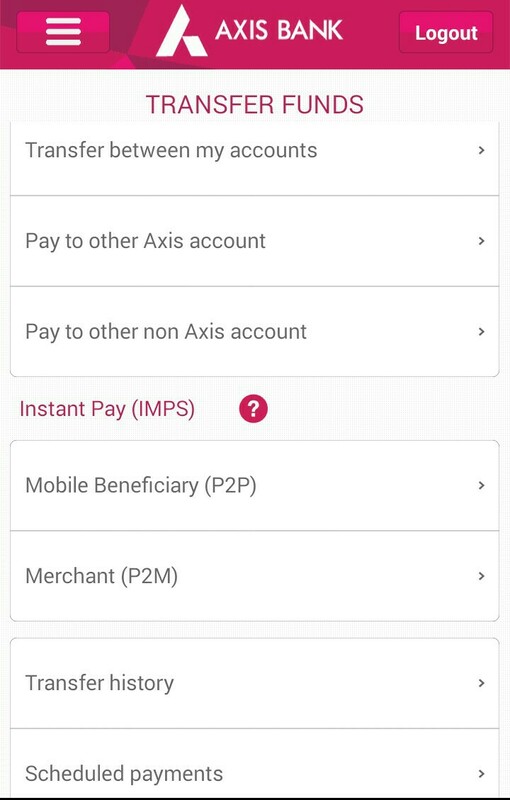 * Instant beneficiary’s addition, well you can transfer money to other Axis bank or other non Axis bank transfers within minutes. * The best part is if you are transferring to other Axis bank account, you just require the account holders registered number with the bank and that’s it beneficiary added. * If you are transferring to non axis bank account, you only require the account holders a/c no and ifsc code isn’t that convenient compared to the sluggish form filling and waiting for a good 8 to 48 Hrs to get you beneficiary added before you can transfer funds. Large variety of bundled services for bill payment, telephones, cards, charity, DTH, Electricity, GAS etc. So now paying bill on the move just got dearer. 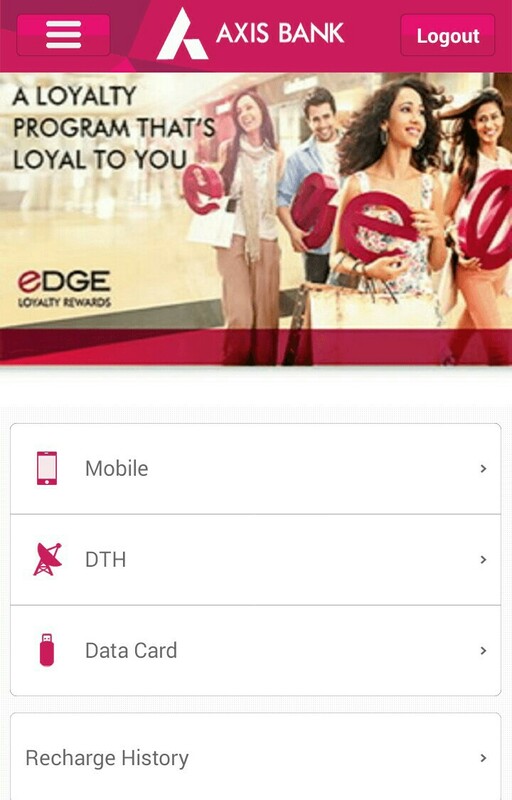 One more handy feature is loyalty points redeem through your Axis bank app, what’s more your points instantly gets approved and you receive the coupons in just minutes, being said that the app also has a feature through which it can locate the nearest offers according to the category chosen. 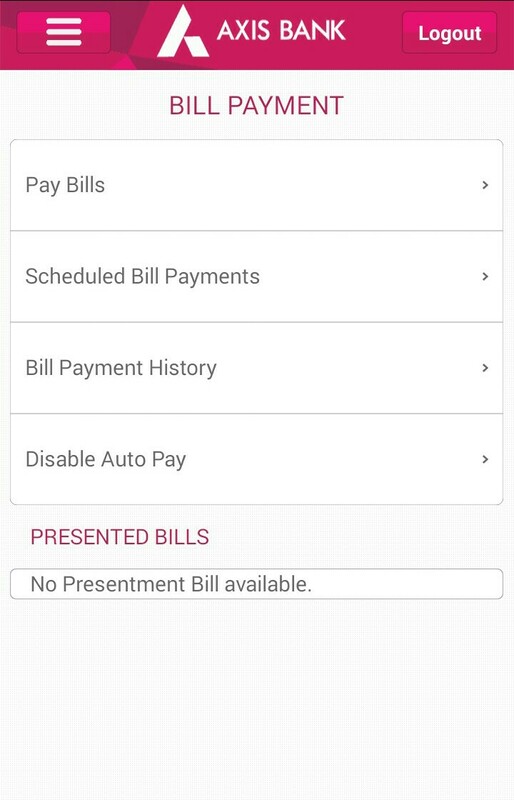 *Add beneficiary to favorites, once you have done a transfer, that so convenient on the go, just put in the amount and the transaction is done. That’s all in terms of the app, and they are still upgrading the app to better suit customer s requirement and the transformation is always on said Mr. Parminder. Had a wonderful time interacting with the staff of Axis bank as well as some fellow bloggers. We are living in a high-tech age and this has made us lazy, very lazy. Shopping sites have grown leaps and bounds. Thou I never expected that to happen in a country like India where INTERNET is still emerging and people are not use to shopping online, however youth has accepted it with both hands and so have the conservative and cautious once. Talking about shopping and not talking about clothing how is that possible. 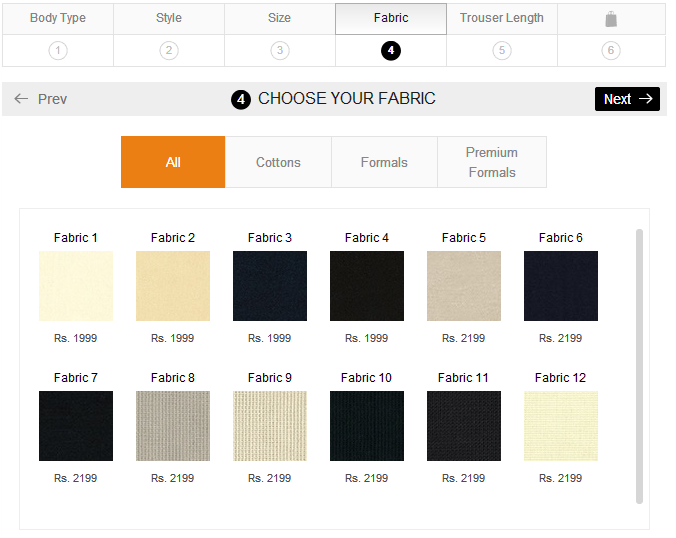 If you see and observe, there is always a discomfort when you think of buying clothing online talking for a man’s perspective, we are always use to the cut piece materials which we generally give to our tailors for stitching thou slowly and steadily the trend seems changing in India. When I feel the need of buying trousers and shirts, I generally prefer branded clothing because now I am very much use to the size, variety of colors, patterns so on and forth, thou there are many sizes available and I always find it difficult to get the perfect size shirt and trouser of MY FIT. 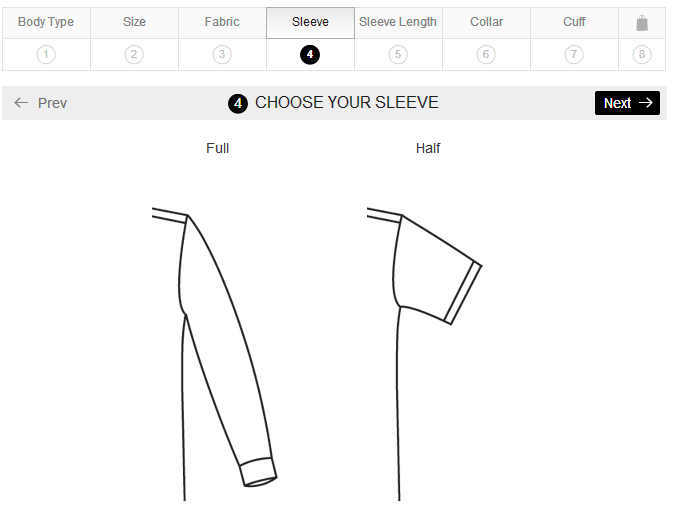 1) Shoulder Size is fix and if someone has a broad shoulder and lean body then have to take a plus size. 2) Generally straight fit not suiting body types. 3) Having a tall upper half body structure, I always have to buy a plus size just to get the length and get it altered. 1) Waist size – as per standard size either you get 32 or 34 – What about 33? 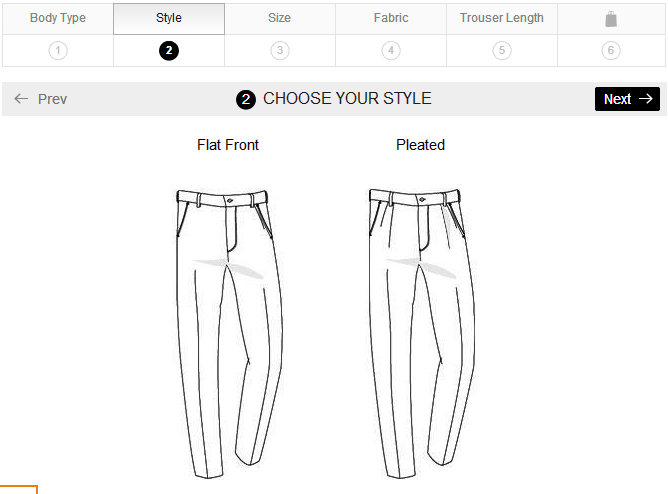 Tailors alter fees needs to be added with every purchase of my trousers. 2) Trousers general come in straight type fit, and some offer slim fits, but I like a comfort upper half and narrow lower half of the trouser, which again I get it altered. 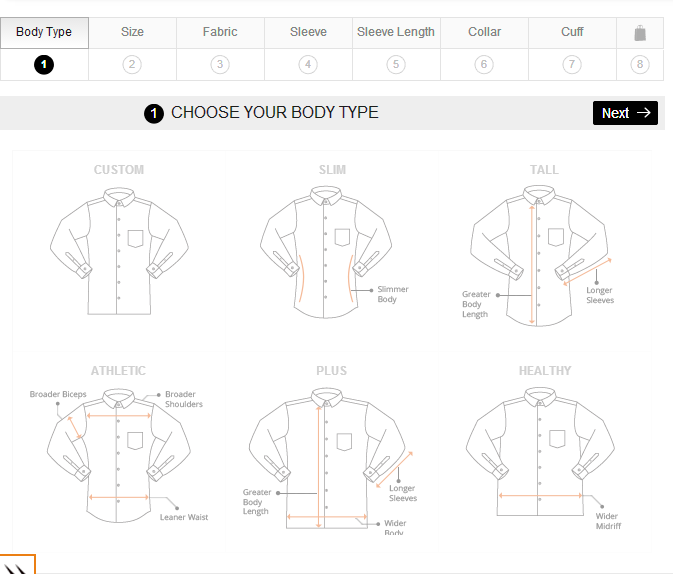 So, what is the solution of finding the right fit of shirts and trousers? 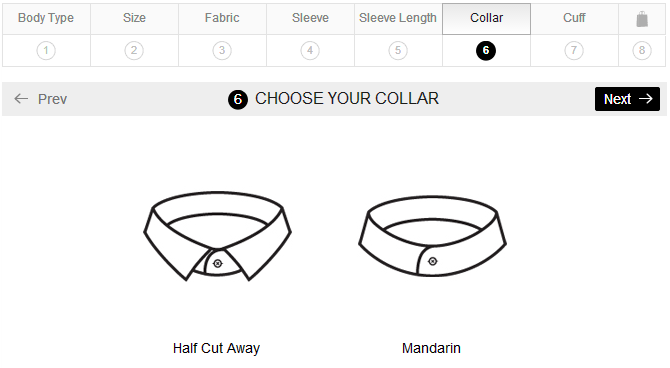 Well recently good folks at indiblogger gave me the opportunity to discover Van Heusen’s MYFIT online boutique for formal shirts, trousers and suits with a voucher. 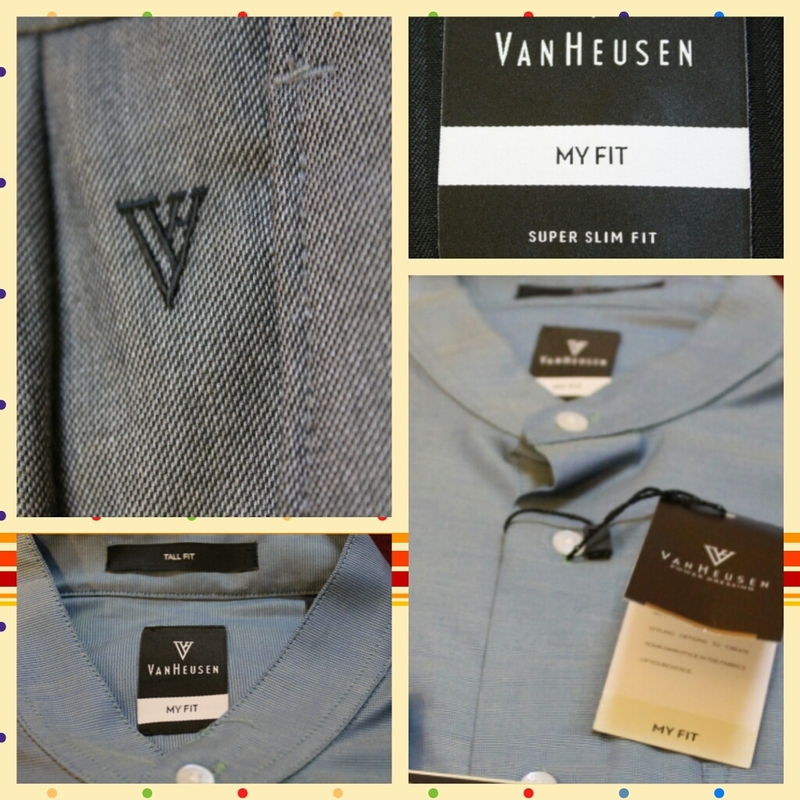 Without any delays I went to my nearest Van Heusen outlet to know more about the MYFIT concept, I met the staff and they suggest me to try out some sizes in shirts and trousers, after trying out few sizes the staff suggested me the perfect size, shirt – 38 tall fit and trouser 33 snug fit, knowing all that I felt like wow, now no one can stop me from looking like a corporate stud. 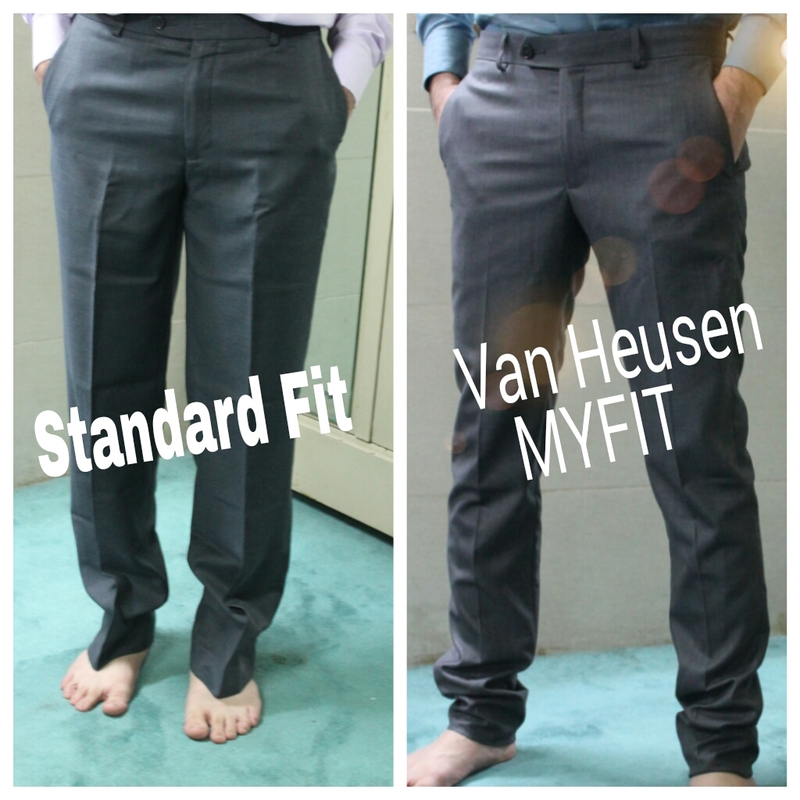 After I knew about details of sizes ,it was time for some innovation time as I had to shop online from the official store for MYFIT – Van Heusen merchandise. 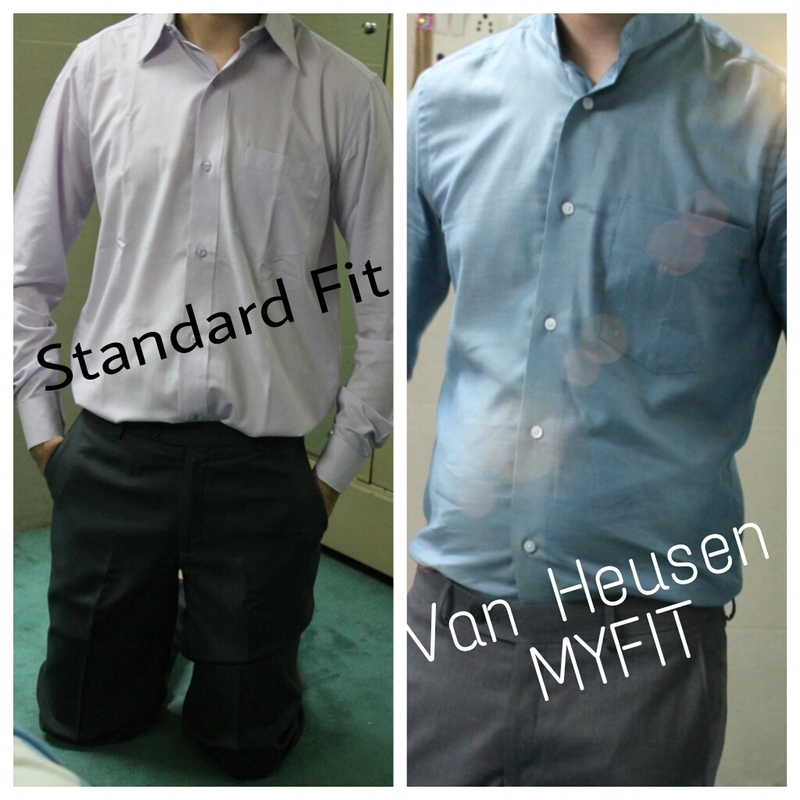 MYFIT is an exclusive program initiative by Van Heusen to help people achieve their perfect fit in shirts, trousers and suits, I will share my experience step wise so that we can capture all the options and know more about the versatile customization options in their online website store. 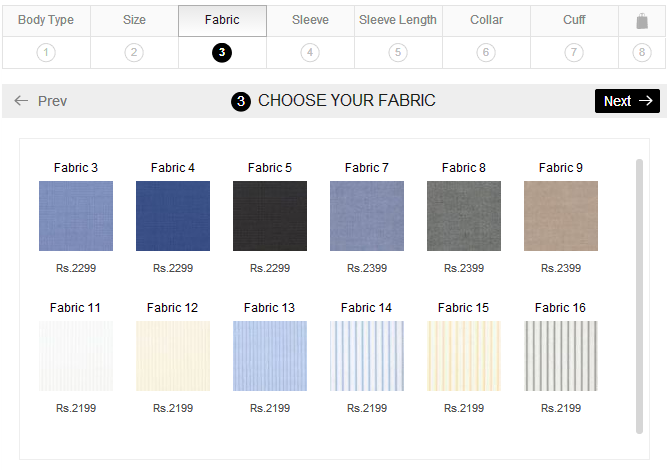 Some fresh, trendy and chic patterns and colors to choose from, hard to select one, just gets better and better. You have options to choose from 2 universal options, full or half sleeve. 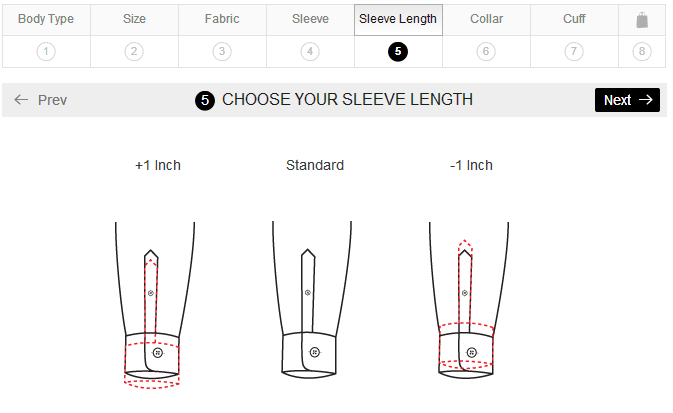 A very thought over option of providing the length size customization, which is rare and one of a kind to get the perfect fit. The trending style of the time, both the options are accordingly to provide you the perfect look. 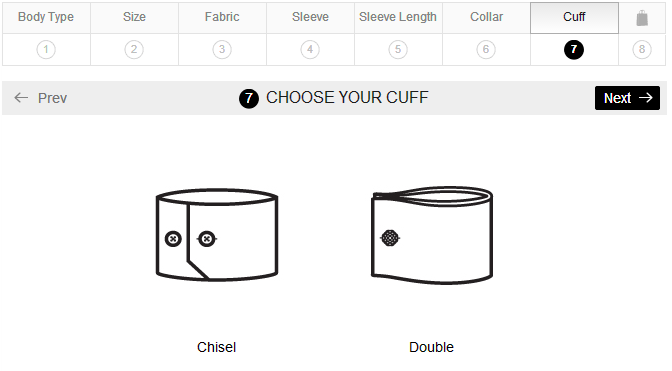 Cuffs have 2 options, Chisel and Double. 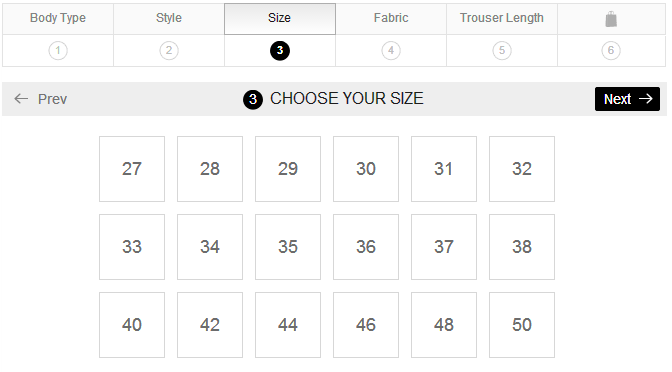 Now the sizes mention here are some amazing customized sizes to get you the perfect fit, which you don’t generally get in other brands. I also got my perfect size which is 33. 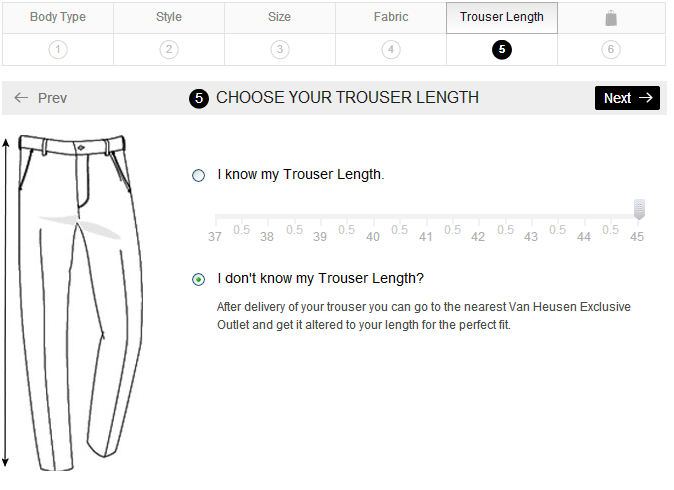 Here also we can see that if you know the length of your trouser, you don’t have to give it for altering, which is a good feature. The best part about this is you get the body type in all sizes, that’s like covering all body types. After placing the order as per the above customization in shirts and trousers, i got the delivery in few days. 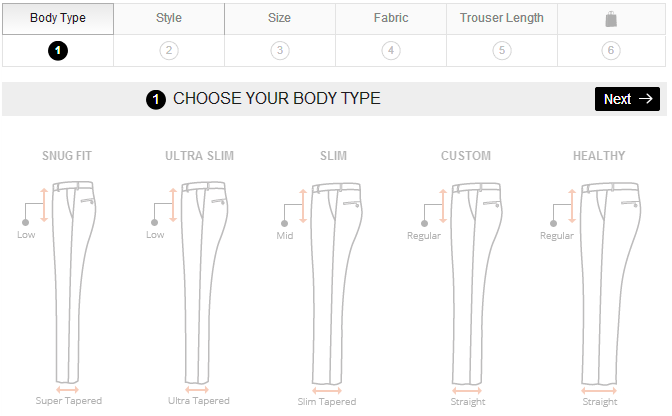 Trousers were also up to the mark, just the right fit both the upper and lower part, in short the perfect fit that i was always looking for, just for comparison sharing the fittings of both standard and MYFIT trouser.